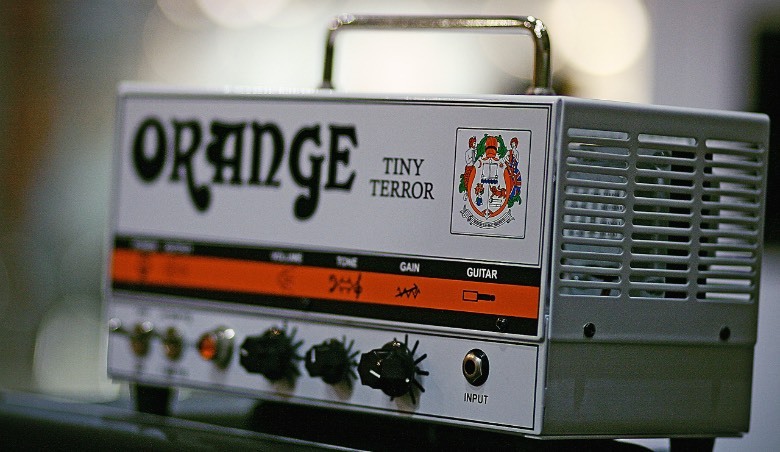 Orange's Tiny Terror is one of a number of brilliant practical stage, studio, and rehearsal amps, in a roster that includes several boutique amps, as well as Fender's Blues Junior, and the Vox Night Train. The Tiny Terror, is available as an amp head (described by Orange as 'the original lunchbox amp), seen in the pic above, or as a combo, housed in a cabinet which will look familiar to anyone with a soft spot for Orange amps. The metal-cased amp is every bit as robust as it looks and that handle makes picking it up and carrying it from van to stage and back again a cinch. It won't take up much space in the back of the van either. When it comes to features, the Tiny Terror's watchword is simplicity. You won't find banks of effects here. There's an on/off toggle switch, another toggle to choose between stage (15 amps) and studio (7 amps), and volume, tone, and gain controls. And that's your lot. Plug in, dial up, and you're ready to go – no fiddling about with presets, or adjusting settings. Simple, it may be, but the Tiny Terror's tone is rich with a capital 'R'. It's versatile to play everything from blues to metal, and all the warmth you'd expect from an Orange tube amp. Inside that metal chassis are two ECC83 preamp tubes and two EL84 power tubes with a solid-state rectifier. The Combo version has a Celestion G10N-40 10in speaker. There's also a 1x12 combo option, which is better-suited to the stage – though you'll still need to put it through a good sound system. In all likelihood, this isn't an amp you're going to want to gig with on a regular basis, but if you want a portable, rich-toned, hard-wearing amp to shift from studio to rehearsal space or even your bedroom, it's an excellent choice. Check out the video demo on the Guitar Hive Blog.